Condemning the recent cancellation of certain classical music programmes and 'intimidation' of artists in South India, close to 160 eminent citizens, including a good number of artists, theatre persons, film directors, judges, academics among others have issued a statement decrying the complete failure of all authorities and institutions to protect freedom of expression. "In a recent occurrence in South India, eminent classical musicians have been intimidated, their concert engagements cancelled, due to pressure from intolerant forces that claim to speak on behalf of Hindus; thereby seeking to dictate the content and nature of cultural performances and music. We, the undersigned, register our strong protest and condemn this continual harassment, intimidation and the use of other undemocratic methods to silence voices," says the statement in public domain signed by eminent Carnatic vocalist T M Krishna, playwright Girish Karnad, film directors Shyam Benegal, Adoor Gopalakrishan and Anand Patwardhan, Bharatnatyam exponent Malavika Sarukkai, singer Shubha Mudgal among others. Referring to the recent attacks on Carnatic musicians, the statement says this was a reflection of the "failure of the rule of law and constitutional guarantees. It is alarming that neither independent institutions such as the courts nor the governments whose duty it is to protect democratic space and freedom of expression, have stepped in to take decisive steps to end this menace." Pointing out that "music has the capacity to be understood and bring together people across boundaries…and underscores the cross-cutting links amongst religions, blending the plurality into the oneness of sound and its appeal to all human beings and has reinforced beliefs in plurality and tolerance," the statement decried the threats received by some Carnatic music singers by Right wing Hindu organisations. of Nithyasree Mahadevan rendering a Christian song began circulating with comments to establish disapproval. The SSVT Temple in Washington DC which had invited T.M.Krishna to sing, cancelled the invitation at the behest of self-appointed Hindu gatekeepers," the statement pointed out. Meanwhile, T. M. Krishna, who is in the forefront of the protests, in a statement said: "Considering the vile comments and threats issued by many on social media regarding Carnatic compositions on Jesus, I announce here that I will be releasing one Carnatic song every month on Jesus or Allah”. 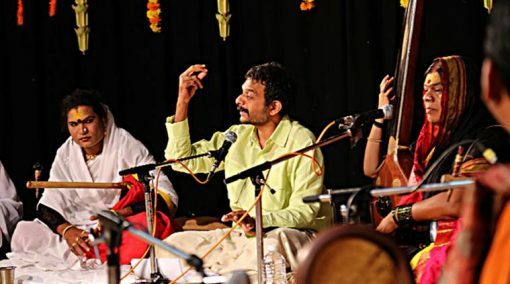 The protest statement, while expressing support to these Carnatic musicians, asserted that "music is not and cannot be denominational, and an exclusive domain of any one religion".